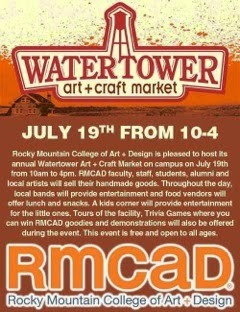 Don’t miss the Watertower Art + Craft Market on Saturday, July 19th from 10am-4pm at Rocky Mountain College of Art + Design (1600 Pierce Street). RMCAD faculty, staff, students, alumni and local artists will see their handmade goods. Throughout the day, local bands will provide entertainment and Susie’s Sweets, Buck Creek BBQ and Sweet Bloom Coffee will offer lunch and treats. Bring little ones to the 40 West Arts kids corner for caricature drawing, face painting and jewelry/bubble wand making. Tours of the facility, trivia games where you can win RMCAD goodies and demos will also be offered during the event. This event is free and open to all ages.